The EWBGCP Chapter was founded in May of 2006 in the Cincinnati, Ohio area. We are devoted towards partnering with developing communities to improve their quality of life through the implementation of environmentally sustainable, equitable, and economical engineering projects. Rwanda: Our first program focused on Rwanda and villages of Muhororo and Ntobwe. Over five years, we significantly increased the amount of fresh water available in the villages, schools and orphanages. We also increased the capability of the local people to continue installation of water catchment projects for cooking and cleaning. 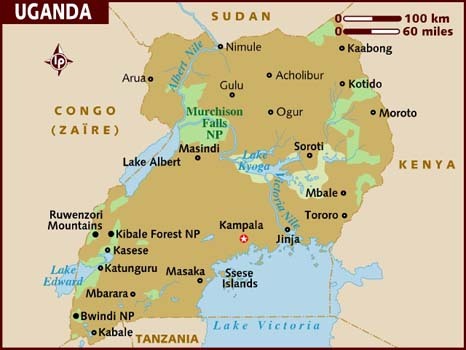 Uganda: Uganda is a landlocked country in East Africa. Uganda is bordered by Kenya, South Sudan, the Democratic Republic of the Congo and by Tanzania. Uganda takes its name from the Buganda kingdom, which encompasses a large portion of the south of the country including the capital Kampala. Sisters of Notre Dame Uganda Mission: The provinces of Covington, KY, and Thousand Oaks, CA, sponsor a mission school in a rural community called Buseesa, in western Uganda. Buseesa, Uganda: Our chapter is partnered with the Buseesa community. Buseesa is very remote with limited infrastructure. Most residents are subsistence farmers with an average daily income of $1.25. Residents must walk long distances to fetch water and then boil it. Typhoid fever, transmitted by contaminated water, is one of the leading causes of death in Uganda. The community has asked us to support projects that improve the accessibility to water and we've successfully installed a shallow well, with additional water supply work underway. This well has already reduced hours that women and children were spending to collect water for use in their homes. We have also helped to install a bio-digester at a school operated by the Sisters of Notre Dame as an alternative energy source to burning increasingly scarce wood. The digester turns animal manure into clean burning fuel powering stovetop burners in the kitchen. Hope for Kabingo Uganda Mission: This Anderson Township, Cincinnati, OH, organization sponsors a mission school and community in southwestern Uganda. Kabingo, Uganda: Our newest program partners with the Kabingo community and with the Miami University EWB Student Chapter. Our professional chapter provides program management while the Miami students run the technical projects. Similar to Buseesa, rural Kabingo has a high need for additional clean water. EWB professionals and students are assessing school and community-wide needs and developing a 5-year master plan for greater-Kabingo. It will include recommendations for water sourcing, purification and distribution. The first project will likely focus on deep-well construction to increase supply. Other water projects will follow according to the master plan. Local Efforts: We also continue to work on projects within our own local communities, especially with Happen, Inc. a unique award winning non-profit that helps children and their parents in Northside. We have worked with Happen to develop handicapped access to a garden in Northside, on educational programs for children in the community and on other engineering related needs.